Hearts manager Craig Levein has called on Scotland fans to get behind Alex McLeish and his team after their two wins during the international break. Scotland beat Albania 4-0, before Celtic winger James Forrest scored a hat-trick against Israel to confirm Nations League promotion along with a play-off spot for Euro 2020. Levein - who gave Forrest his international debut when he was in charge of Scotland - praised McLeish's work after he received criticism after defeat against Israel in the reverse fixture. 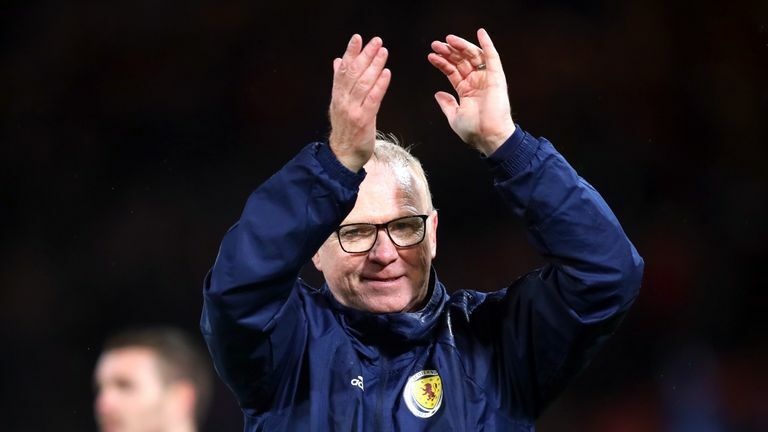 Alex McLeish is "slowly but surely" turning around the confidence of supporters after Scotland clinched a Euro 2020 play-off place, says Billy Dodds. "I think [Forrest] is a fantastic football player. Wingers are notoriously up and down and confidence is a huge thing," said Levein. "I'm delighted for him and thrilled to bits for Alex (McLeish). I know how difficult it is, how sometimes things can work against you and make it difficult for you to do that job. "But I'm chuffed to bits how he has managed to get two fantastic results. They played well in both games and it'll be great if the fans can get behind him and the team and see if we can really kick on from here." Speaking ahead of Hearts' game at St Mirren, Levein says he is hopeful of extending centre-back Jimmy Dunne's loan spell - which currently expires in January - after speaking with Burnley boss Sean Dyche. "I've spoken to Sean (Dyche), and we'll speak again early January," added Levein. "In principle, we felt it was quite a good idea for him to prolong his stay here. "I've not bottomed that out completely, so I'll do that once I get past these games leading up to the winter break."